Our Board Certified gastroenterologist, Dr. Raza Hamdani, is dedicated to providing the highest quality of personalized care and attention to each and every patient using the latest leading edge diagnosis, technique and medical treatment. Dr. Hamdani looks forward to meeting you and serving your medical needs by providing you with the highest quality of medical care. Dr. Hamdani is Board Certified in Gastroenterology and Hepatology. Dr. Hamdani followed in his father’s footsteps to become a physician. He received his MD degree from the College of Medicine, University of Lagos, after six years of training and instruction. In 1985, he completed a three-year residency in Internal Medicine at the Cook County Hospital in Chicago, where he also served as the Chief Medical Resident. Dr. Hamdani began his specialty training in Digestive Diseases at the Yale University, New Haven, Connecticut, and served as a Post Doctoral Fellow. He went on to train at the University of Pittsburgh and obtained his Board Certification in Critical Care in 1991. 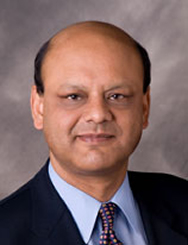 Dr. Hamdani completed his training at the University of Iowa with a three-year fellowship in Gastroenterology and obtained his Board Certification in Digestive Diseases in 1995. Upon completion of his training, Dr. Hamdani started practicing medicine in Illinois where he served at the Loyola University Medical Center as an Assistant Professor of Medicine. He helped launch the liver transplant program and performed research in artificial liver devices to help patients with liver failure. His work resulted in the establishment of a dedicated intensive care service for patients with liver diseases, one of a handful in the United States. Dr. Hamdani has conducted extensive research in Digestive Diseases and his work has been presented in national and international scientific meetings. He has been a reviewer for various scientific journals and has authored several chapters in scientific textbooks, including the authoritative textbook on Liver Transplantation. He has also published several scientific research articles in the field of Digestive Diseases. In recognition for his contributions to the field of Digestive Disease, Dr. Hamdani was awarded a national award of excellence in scientific research. Prior to starting Advanced Gastroenterology, Dr. Hamdani served as the Associate Director of Liver Diseases and Liver Transplantation at the Southern New Jersey Regional Transplantation Center. He led the program to national certification with over a 90% survival rate. He also established liver transplantation training for Fellows at the University of Medicine and Dentistry of New Jersey. Dr. Hamdani has been in private practice for more than 20 years and has performed over 10,000 endoscopic procedures, an attestation to his extensive expertise and experience. He is focused in the care of patients with acid reflux, peptic ulcer, irritable bowel syndrome (IBS), inflammatory bowel disease, colitis, colon cancer and liver diseases. He also specializes in the treatment and care of very sick patients with Digestive Diseases and in minimally invasive procedures as weight loss treatments for obese patients. Dr. Hamdani currently serves as an Assistant Professor at the University of Illinois, College of Medicine. Dr. Hamdani followed his father, who had served as a doctor under a United Nations medical program, into the medical field. His career which started in Chicago, has taken him to several major U.S. cities. Since 2007, he has settled back in Illinois with his family serving the medical needs of the west Chicagoland communities in Naperville, Aurora, Wheaton, Elgin, Joliet and Bolingbrook.